The UEFA Champions League came to Cardiff over May and June 2017. It was an unforgettable period for the city from the moment a dragon appeared embedded on Cardiff Castle walls in mid-May, and I was lucky enough to have a front row seat for most of the events. This was a huge thrill for me as a photographer who has lived in Cardiff most of my adult life, and as a football fan. Cardiff, Wales, UK, May 12th 2017. Cardiff Castle decorated with a dragon and branding ahead of the Champions League Final at the National Stadium on June 3rd. – The Champions League Final between Real Madrid and Juventus at the temporarily named ‘National Stadium of Wales’. Cardiff’s face was entirely changed for several weeks, not least by the strong presence of armed police in the wake of the Manchester terror attacks, who conducted daily security checks on the city centre’s sewers. As well as branding across the city, on Cardiff City Stadium and the main ‘National Stadium of Wales’ as it had been named for the event, there was a large Champions League Festival in Cardiff Bay and a floating football pitch just off Mermaid Quay. The pitch played host to a number of matches, including an Ultimate Champions Match between Champions League legends the day before the men’s final. 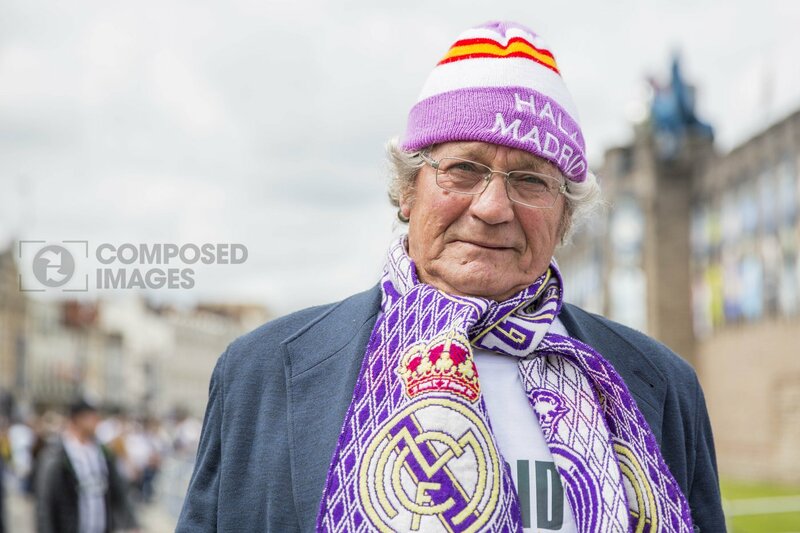 A Real Madrid fan ahead of the UEFA Champions League Final match between Real Madrid CF and Juventus at the National Stadium of Wales, Cardiff, Wales on 3 June 2017. Photo by Mark Hawkins. 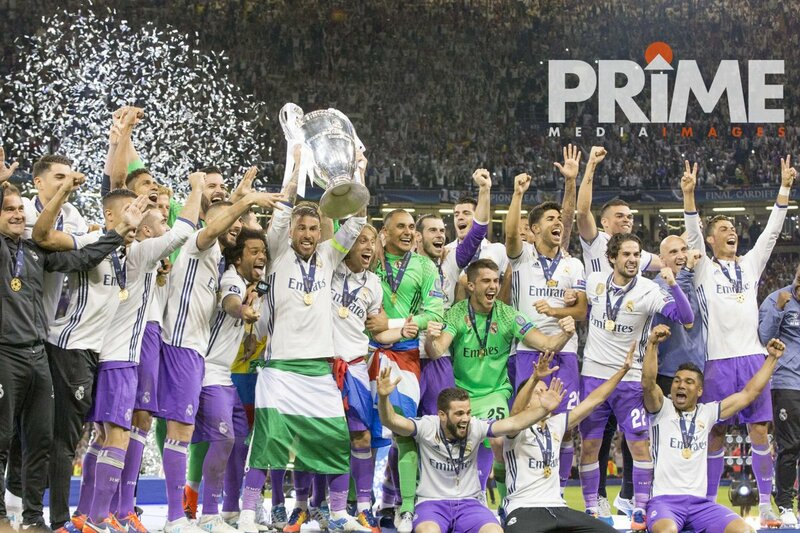 Cardiff born Gareth Bale of Real Madrid lifts the trophy after the UEFA Champions League Final between Real Madrid CF and Juventus at the National Stadium of Wales, Cardiff, Wales on 3 June 2017. Photo by Mark Hawkins / Prime Media Images. The Final itself was an extraordinary match for a number of reasons, and a match unlike any I’ve ever previously photographed. This is not surprising perhaps, given the profile and magnitude of the match, the stature of the players involved. What made it most remarkable was the fierce level of competition. Never have I photographed alongside quite so many photographers. There were sprints for and intense scrummages upon two podiums for the trophy-lift. As players celebrated on the pitch after the match, we chased and zig-zagged, trying to get an edge. You run alongside others trying to think of shots with various items of kit dangling off you, attempting to be as smooth and un-clumsy as possible. But it’s tough and I didn’t come away with a whole lot that was much good, or much different to the next photographer. On this special occasion, rather than litter a post with pictures I’ve packaged still images together in an extended video, embedded from YouTube below. At eight and a half minutes it’s probably far too long, but hopefully a few seconds will give a flavour. (The main event of the match is towards the end). Please forgive the cheesy royalty free iMovie tunes. Cardiff as a city did itself proud in successfully hosting the main event and all the events around it. It truly proved itself as a Champions League city, when there were doubters. Big credit should go to all those involved. Find out more about sport photography and street photography services from Composed Images.